This represents '#pragma omp sections' directive. 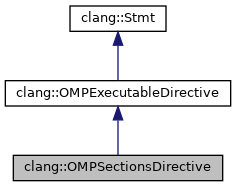 In this example directive '#pragma omp sections' has clauses 'private' with the variables 'a' and 'b' and 'reduction' with operator '+' and variables 'c' and 'd'. Definition at line 1269 of file StmtOpenMP.h. Definition at line 1326 of file StmtOpenMP.h. HasCancel true if current directive has inner directive. Definition at line 239 of file StmtOpenMP.cpp. Definition at line 254 of file StmtOpenMP.cpp. Definition at line 1324 of file StmtOpenMP.h. Definition at line 1270 of file StmtOpenMP.h.